Coffee grows on evergreen shrubs, or small trees, which mature to 15 or 20 feet high. The coffee plant produces fragrant white flowers and small red fruits, or "cherries," so named because they closely resemble cherries. These fruits are highly valued for their seeds, or coffee beans, which are hidden inside a sweet pulp exterior. Coffee is grown in most tropical countries, but it grows best in climates where the temperatures range from 50 to 80 degrees Fahrenheit (13 to 26 degrees Celsius). The coffee plants require rich, moist soil with excellent drainage; mature plants flower and produce fruit almost continuously. A fully-grown coffee plant produces an annual crop that yields about 15 ounces (450 grams) of roasted coffee. Microclimates, soil types, and farming techniques all combine to impart distinct flavor profiles to coffee beans; these flavors are then enhanced by careful processing, roasting, and brewing techniques. Plants of many coffee species grow in the wild, but the primary coffee varieties grown commercially are Arabica and Robusta. Arabica grows at an altitude of 3000 to 6000 feet, has a caffeine content of 0.8 to 1.5 percent, a mild taste, and a relatively high price. Coffea Arabica plants grow from seedlings to mature plants in four or five years. 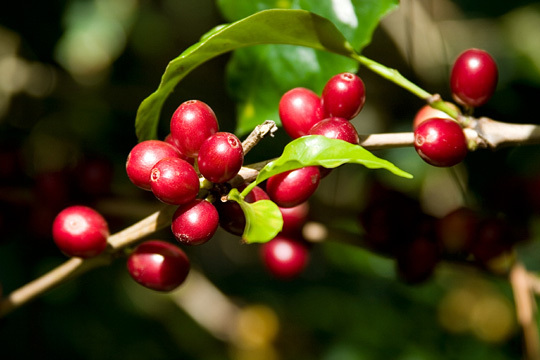 Robusta grows at an altitude of sea level to 3000 feet, has a caffeine content of 1.6 to 2.5 percent, a bitter flavor, and a relatively low price. Coffea Robusta plants grow to maturity in only two or three years.